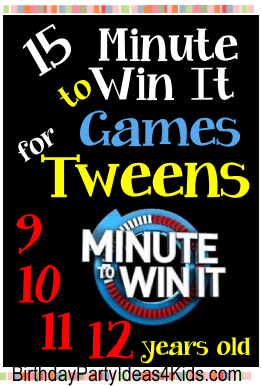 Fun and challenging Minute to Win It style party games for tweens ages 9, 10, 11 and 12 years old. Easy and inexpensive games to set up and play at a party for boys and girls. Have the tweens play each game together or set up stations that they can rotate between. Keep score and give small prizes or trophies to the winners. Blow up several balloons and give each player three of them. The players must keep their balloons in the air for one minute. To make this more difficult, do not allow players to use their hands. Divide players into teams of two. Give one player a bucket and the other ping pong balls. Have the player with the bucket put it on top of his/her head and stand fifteen feet away from his/her teammate. Have the player with the ping pong balls throw as many balls as he/she can into the bucket on the teammate’s head. The team with the most balls in the bucket at the end of one minute wins. Take popular cereal box boxes and cut the front into fifteen puzzle pieces. Give the players one minute to put the puzzles pieces back together. Give each guest a small cookie, such as an Oreo, and have them put the cookie on their forehead. The guests must get the cookie from their foreheads to their mouths within one minute without using their hands. Supply the guest with a plate of cotton balls. Have the guest put Vaseline on his/her nose, then place his/her nose on the plate with the cotton balls to pick one up. The guest must then run the cotton ball stuck on his/her nose to a plate on the other side of the room. The guest continues doing this until the minute is finished. Supply the guest with 28 plastic cups, such as the red disposable Solo cups. The guest must stack the 28 cups into a pyramid and unstack them within one minute to win. Have the party guests stand side by side and designate an area ten feet away. The guests must lose a shoe on their foot and kick it off so that it lands right side up across the line. The first guest to do so wins. Put a tennis ball into the leg of a pair of pantyhose and set up ten plastic cups on the floor. Have the player put the pantyhose on his/her head so that the tennis ball hangs down towards the floor. The player needs to use the tennis ball to knock down all of the plastic cups in under one minute. Take a large emptied out tissue box and fill it with five ping pong balls. Secure the box on the player’s hips with the opening facing out. The player has one minute to jump and dance around to make the five ping pong balls fall out of the box and onto the ground. Stack six cups into a pyramid. Have players stand ten feet away and shoot rubber bands at the pyramid to knock it down. Whoever can do this in under one minute wins! Give each guest a craft stick and six dice. The guests must put the craft stick in their mouth and balance six dice in a stack on the end. You can either have players win after they keep the dice balanced for three seconds or you can see who can keep the dice stacked the longest. Supply each player with a pair of tweezers and a bowl full of tic tacs. Have the players use the tweezers to transfer the tic tacs into a different bowl. The player who transfers the most tic tacs in a minute wins. Give each player two full tissue boxes. Have the players try and pull all of the tissues (one at a time) out of their boxes within one minute. Put a roll of toilet paper onto a broom handle and hold both ends of the handle so the roll can be unwound. Have a player grab the free end of the toilet paper and spin in a circle so the paper wraps around him/her. The player who can unwrap the entire roll of paper in under one minute wins. Supply each player with wrapped Hershey’s kisses. The player who can unwrap the most kisses using only one hand within a minute wins!